Although the distillery is not mentioned on the label, it is a public secret that this is a Mortlach. 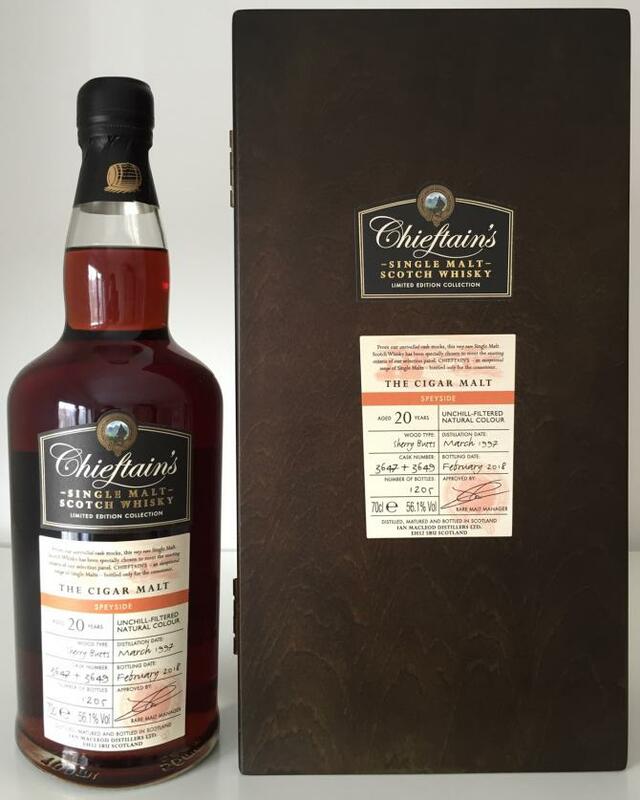 Ian MacLeod has bottled a couple of these Speysiders under the ‘Cigar Malt’ banner – which made some think this was a Dalmore, but that is not the case. The mahogany color alone makes me want to give this a try. OMG… this is great! A veritable umami sherry bomb! All dried fruits that you would associate with deep sherry: figs, dades, sultanas, plums, but also cherries, dried apricots and a panoply of spices with cloves and cinnamon in the lead, followed closely by candied ginger and nutmeg. Leather, tobacco, chocolate, old books, he has it all and more. This is a monster! While it starts somewhat peppery and even a touch astringent on tannins and leather, the sherry immediately kicks in with the dark and sweet notes that I already detected on the nose, upholstered with rosewater, tobacco and elderflowers. Some orangettes and espresso shine through, as does ginger and chocolate. It goes up and down between bitter and sweet and it works! This is a beautiful malt. The finish… ah… the finish… yes, it lasts forever and shows – before dying a bitter death on tannins – once more its umami character with leather, pipe tobacco and dark honey, while some roast beef lingers in the background. Absolutely stunning whisky. You can get me out of bed in the middle of the night for this baby. Wake me up before you go-go! Thanks, Manny. Wonderfull whisky, great nose, mouthcoating but unfortunately medium finish. These high level drams are quite rare for that price these days (€199). Yes! Full sherry with figs, dates, raisins, coffee and chocolate. Dark chocolate, tobacco leafs, again full sherry and some rose hip. Medium drying with nuts, syrup and oily. Really good one! However, the 2017 release is better. Cherries with dark chocolate (the one with > 90% cocoa) plus a mix of dried fruits like plums, etc. but really hard to distinguish single ones. It's a quite complex nose! Spicy, peppery start, lot's of sherry, a dirty, astringent profile with tabaco, leather and tannins. Long and spicy - it becomes even even a bit sweet and turns back being slightly bitter in the end. Again lot's of tannins. The wonderful flavors still echo a felt eternity. Rarely have I had such an intense malt in the glass and fortunately I still have a few cl of this wonderfully old and solid malts in reserve! A dreamlike drop, I really like it very much! Deep dark copper radiates from the glass, on the glass wall adheres a thin streak from which dissolves a variety of long drops and relatively quickly back into the glass runs back. Dark berries and tart leather powerfully exude their dreamlike scent. Dried raisins and dates mix with cedar and dried tobacco leaves. Dark sour cherries and slightly wet leather combine with the dark berries to a beguiling fragrance, already my salivation is massively stimulated. Dark caramel drips on old leather, a humidor is opened and the various tobacco notes are distributed in the room. Sweet tobacco crumbs and old dried tobacco leaves dominate the nose at the moment, again an enchanting combination of dark, dried berries, cedar wood and leather rises. A touch of freshly brewed espresso follows the dark sherry flavors, rasp of dark chocolate merge with the dark caramel. 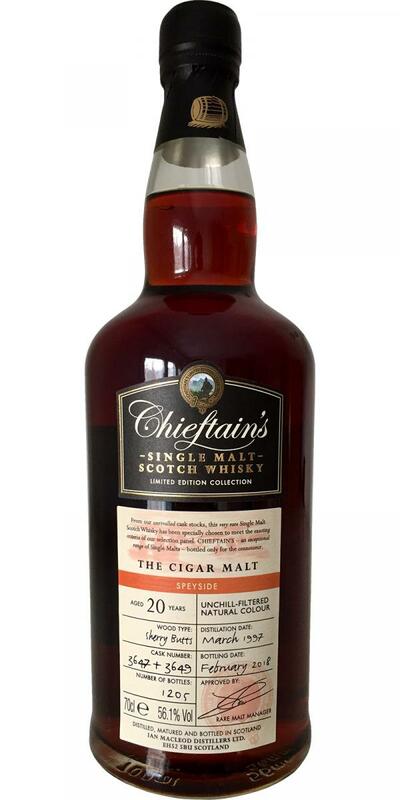 The nose shows at any time with its dignified character and the beguiling aroma cargo that here is a special and old malt in the glass. My salivation is now almost unbraked, I must try the Cigar Malt immediately! Herb and intense, the dark sherry and leather flavors bounce on the first sip on the palate, the tongue is immediately enveloped by a plump warmth. A combination of sweet and dried berries immediately mixes with tart leather and old tobacco flavors, spicy wood elements combine with dark caramel and sour cherries. Discreet pungency surrounds the tongue, the palate is ensnared by slightly dry and tart aromas. Milk chocolate slowly turns into dark chocolate, sweet plums and sour cherries break through the old leather and tobacco notes. Sweet and creamy with harsh influences, the wonderfully old and dignified flavors rest for minutes in the entire mouth, the plump warmth never seems to end. Again freshly brewed espresso rises, bittersweet chocolate with small pieces of walnuts melts on the tongue. The bitter and sometimes bitter leather aromas still rest on the palate. Old and dried tobacco leaves fall into cold espresso, subtle sharpness in the form of mild pepper is on the tongue. The chubby warmth still clings to the palate, the aftertaste reminiscent of the variety of wonderful flavors. Tart and sweet components play together, the mouthfeel is creamy and dry at the same time. The aftertaste never seems to end, oily and creamy, the aromas rest for an eternity in the mouth. Slowly a tart leather flavor crystallizes in combination with sweet tobacco leaves and dominates the rest of the after-sound. Very nice one, full of aroma's and taste, and pretty smooth for it's pretty high Abv. Lots of red fruits, prunes, raisins, coffee, pure chocolate, herbal, cinnamon. Very nice sherrycask influences. Surprisingly smooth, only a little tickering on the tongue. Again prunes, coffee, chocolate, full body. Still a little pepper remains, chocolate, red fruit, coffee, some honey now. Pretty long. Not very complex but really intense. Bramble, blackberry jam, toffee, mocha, hazelnut paste and raisin. With water a little marzipan. Blackberry, mocha, spice and raisin. Blackberry, mocha and hazelnut paste.